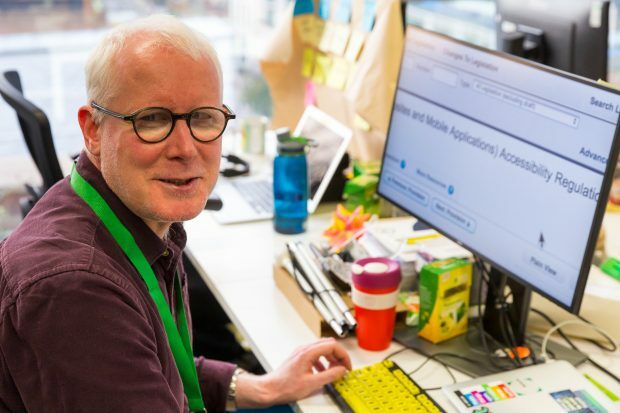 I work in the Government Digital Service (GDS) Accessibility Team and I’ve been at GDS for about 10 months. I’ve also worked on the Common Technology Services team and on GOV.UK Platform as a Service. I have a condition called oculocutaneous albinism - which means my body has a reduced amount of melanin - with nystagmus, which means my eyes can make involuntary movements. Both of these things affect my eyesight and I’ve had the condition since birth. Because of the nature of my work - which involves lots of close reading and writing - there are some adjustments I have to make in the workplace. Here’s how I work at GDS. My condition means that I have quite low vision and I can’t see at distances. When using a computer I need to use magnification. My eyes are also really sensitive to intense light and I don’t have a depth of field - so 3D movies are a bit of a waste of time for me. I have to zoom in on my work a lot of the time and I use the built-in zoom on Macs. In previous jobs I’ve used ZoomText to do this. Here at GDS I also use a high contrast keyboard and I use an ultra-sharp monitor, which works really well. When I was interviewing for my job at GDS I was up-front about what I would need and when I joined I had an informal assessment which meant I could get the kit I’m using now. I’m hoping to have a more structured assessment soon with an assistive technology expert. This will be really useful because at the moment I’m only using the kit that I know is available. So there might be things out there I’m not aware of that could be useful for me. Fortunately I’m quite tech-savvy, so I think I know most of what’s available, but if you’re not, then this could be a problem. My advice to anyone when they start a new role and think they might need assistive technology would be to speak to an expert organisation - like the Royal National Institute for the Blind in my case - and then to ask your employer to set you up with a technical expert who can advise you. Before I joined GDS I worked for a time at the BBC. I was in the disability programmes unit, so the team there had a pretty good idea of the sort of assistive technology people needed. The BBC also used the government’s Access to Work scheme, which helps to buy assistive technology. This could be useful for any organisation that needs to support those with access needs. Fortunately, this equipment is provided for me working at GDS. I sometimes use a long cane and on occasion I’ll carry this with me deliberately when I’m going to meetings so that people are aware I have a visual impairment. At GDS we need to be at the top of our game as we are the organisation in government that should be keeping the standards high, and others look to us for leadership. The culture is very good and people want to do the right thing. I’d met GDS Head of Accessibility Al Duggin at meetups before I joined so I knew a bit from him about what it was like. Sometimes people can still forget about accessibility issues, but if you mention it, they generally take steps to improve things. But the worst thing is when people are aware but do not make adjustments for me. For example if they’re giving a presentation and put up a complex diagram but do not explain what it is. One thing that might be helpful to raise awareness with staff generally would be to talk more about accessibility in our induction process. Accessibility is such a big thing in everything that we build and run and it should continue to be a big part of our culture too. Find out more about the government’s accessibility community. You can also join the accessibility Google group or the cross-government accessibility Slack channel.